IMAG0178, originally uploaded by f_a_h. 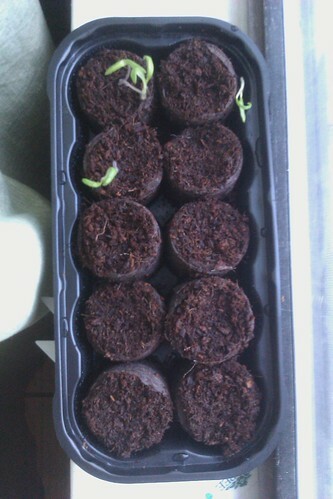 These are my Amish Paste tomatoes that have sprouted. They share a tray with the jalapenos and the cherry tomatoes that I planted over the weekend. I moved the trays to the front window this year. It's in the kitchen so it's nice and warm and obviously the seeds like it. Every time I see that, I think its cupcakes. Mmm...big girl thinking!